It comes as welcome news that the United States Department of Transportation Inspector General is concerned about the integrity of high-speed rail projections, “including ridership, costs, revenues and associated public benefits.” The issue has become ripe as a result of the $8 billion for high speed rail that the Obama Administration slipped into the economic stimulus bill early in 2009. The response was more than 250 applications from 30 states totaling $57 billion. It is easy to understand the Inspector General’s concern, though no-one should be surprised that the demand for free money outstrips the supply. Applicants range from the huge California High Speed Rail proposal, to a greenhouse gas belching magnetic levitation (maglev) line in population-losing Pittsburgh, to comparatively modest railroad grade crossings that could improve both railroad and highway safety. In a January 4 letter to the Federal Railroad Administrator, Inspector General Mitchel Behm announced an evaluation of “best practices” with respect to high-speed rail forecasts, noting that “it is of critical importance that the Federal investments are directed to the most worthy projects.” For starters, the Inspector General needs to understand that there are is no such thing as “best practices” in high-speed rail forecasts. Best practices and high speed rail in the same sentence sounds like a line from a comedy routine. 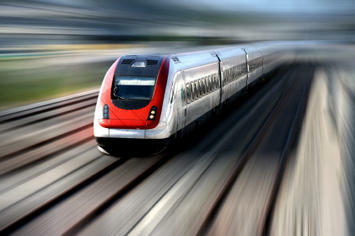 The record of ridership, revenue and cost projections in high speed rail projects is abysmal. An Object Lesson: The Las Vegas Monorail Default: This was brought home earlier this week, when the privately financed Las Vegas Monorail defaulted on its bonds, principally because its ridership was absurdly over-projected. Even before the economic implosion (2007), the Las Vegas Monorail was carrying only 21,000 riders per day, far below the 53,500 riders that had been predicted for 2004 by the world-class planning firm retained by the promoters. In 2000 we produced a report predicting that the Monorail would carry between 16,900 and 25,400 daily riders. The reality was in the middle of that range. Of course, no venture could survive with consumer demand 60 percent below projections and default was inevitable, as we predicted. People who purchased the bonds may have overlooked the shaky foundations of the project, assuming that the state required bond insurance would make them whole. It did for the first defaulted payment, however the bond insurer, Ambac, itself is also in financial difficulty. Abmac has been characterized as “a borderline insolvent bond insurer.” Following Ambac’s debt payment, the Las Vegas Monorail filed for bankruptcy improbably claiming that it was necessary to permit expansion to the airport. High Speed Rail Follies: Of course, the Las Vegas Monorail is not a high-speed rail line, but high-speed rail projects are subject to the same risk of absurdly inaccurate projections of ridership, revenue and costs. The California proposal, in particular, anticipates substantial private investment. Anyone courageous enough to invest will want due diligence performed by consultants other than those who produced the numbers to support the Las Vegas Monorail bond issue. Within the past few days, the non-partisan California Legislative Analyst’s office issued a critical report of the new California High Speed Rail business plan. The most damning criticism was that the plan “appears to violate law, because it assumed operating subsidies, which were prohibited by the bond issue passed by the voters of the state. This is particularly relevant to the USDOT Inspector General’s inquiry, since the California High Speed Rail Authority has been claiming for years that the project would not require operating subsidies. California, needless to say, is not in a position to be offering subsidies of any kind. Taiwan’s high-speed rail line, the only fully privately financed line in the world, has attracted approximately one-half of its projected ridership and has suffered considerable construction cost overruns. During its first few years of operations, its debt has been restructured, its bonds downgraded, expansion plans have been suspended and the Taiwan government has now taken majority control of the board. It should not be long before Taiwan taxpayers will be footing the bill. The new high-speed rail line in Korea is attracting approximately one-half of its projected ridership, while its costs were three to four times the projected level. 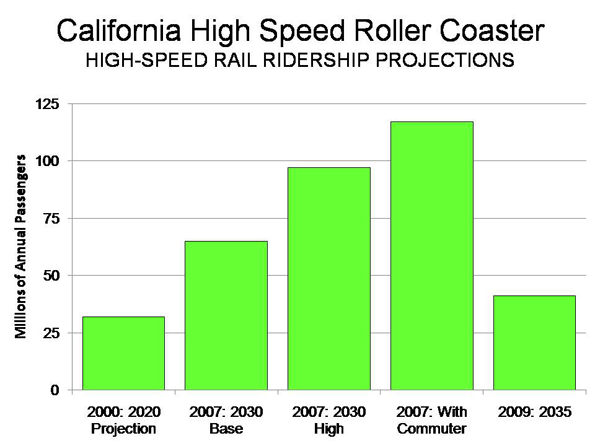 The California High Speed Roller Coaster: The proposed California High Speed Rail system seems poised to break “lower the bar” even further with respect to performance relative to projections. The ridership projections have been like a roller coaster. In 2000, the California High Speed Rail Authority’s modelers predicted, in an “investment grade projection” that the system would carry 32 million riders a year by 2020. Then, in 2007, the projection gurus raised the “base” number to 69 million by 2030 and added a “high” number of 97 million. By the time the high speed rail bond election was underway, some Authority board members went around the state citing a number of 117 million riders that included commuter ridership. Joseph Vranich and I projected annual ridership of 23 million to 31 million for 2030 in a report published by the Reason Foundation (The California High Speed Rail Proposal: A Due Diligence Report). We also predicted, based upon our analysis of high speed rail systems worldwide, that the costs will rise by as much as another 70 percent to cover the usual cost overruns and to build portions of the system not included in the projections. The erratic ridership projections are just the beginning. We also found the proposed fare structure to be far too optimistic (fares far too low). Apparently the California High Speed Rail Authority agrees, because it has doubled its proposed fare levels. Meanwhile, its costs continue to rise, despite having risen by half from 2000 to 2008 (inflation adjusted), at the same time that the size of the proposed system was shrinking. Perverse Incentives: Part of the problem here lies with incentives. The “world class“ consulting firms have no incentive to produce reasonable numbers. Indeed, some actually participate in later stages of the projects and as a result have exactly the opposite incentive – an interest in projections being optimistic enough that the project gets approved. Solutions: The Inspector General might look at removing the incentive for misrepresentations and exaggeration, by prohibiting the participation of planning consultants in the implementation phase of high speed rail projects. Another modest proposal could revolutionize major project projections. Perhaps the world class consulting firms should be required to guarantee their projections financially. We certainly wish the Inspector General the best, though he has certainly set a standard (“best practices”) not likely to be achieved. But perhaps he can move the industry from absurdity to least worst projections. Submitted by jay11 on Mon, 08/27/2012 - 05:59. Submitted by The Placemaking Institute on Mon, 01/18/2010 - 11:46. And we here at The Placemaking Institute also wish that your argument and solution be applied to toll roads, many of which are verging upon defaulting their bonds, and highways, which the sole focus upon constructing them has put most state DOTs on the brink of bankruptcy (the reason why such things are increasingly being privatized throughout this country). To give just one example from here in Texas: "TxDOT concluded that the 15 miles of SH 99 from I-10 to US 290 will cost $1 billion to build and maintain over its lifetime, while only generating $162 million in gas taxes — just 16% of the total cost."